A common problem for construction and demolition sites is what exactly to do with all of the leftover rubble. Instead of carting it all off to a landfill, crushing equipment can help to break down large chunks of rock and other debris into gravel or dust. This gravel can then be used in other construction projects so that it does not go to waste. Variations of crushers have existed for centuries, dating all the way back to the 1600s. The basic principle of how they work involves applying pressure to the material to be crushed so that the molecules making up that material are forced to separate from each other, thus breaking the material into smaller chunks. When applied over and over again, that pressure can break down the rubble into dust or small rocks. In order for crushers to work, the material applying the pressure needs to be stronger than the material to be crushed. In most modern heavy equipment for crushing rocks, the crushing jaws are made from cast iron or cast steel, resulting in jaws that are strong and durable. When it comes to heavy equipment for crushing rocks, your work site can do no better than the IronWolf Crusher. 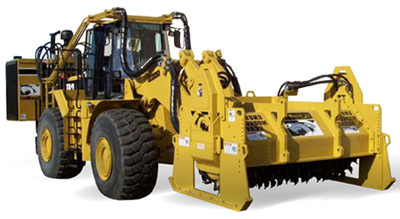 This piece of machinery is designed to attach to the front of a wheel and track loader. This gives you ample ability to move the crusher around your site, crushing and grinding everything in its path. The IronWolf Crusher is available in several sizes to meet the needs and requirements of your particular work site. The crusher includes a cutter assembly, cutter drum and auxiliary engine package, giving you everything you need to get started using it right away. The next time your work site is in need of heavy equipment for crushing rocks and other materials, the IronWolf Crusher is the way to go. If you are unsure of which size is most suitable for your needs, or if you have any other questions about our products, one of our associates would be more than happy to assist you. Get in touch with us today to get your construction site equipped with everything you need to get crushing.